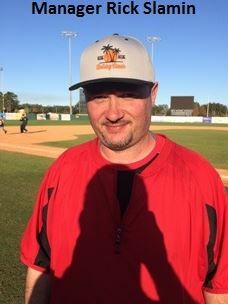 January 15, 2018, Kissimmee, FL – Not stolen equipment, an extra-inning semifinal or having to play a dominant opponent in the finals could keep the Tampa Thunder from fulfilling a promise a year in the making. Geovanie Rodriguez, a late addition to the team, tossed a three-hitter and the Thunder parlayed a four-run first inning into an advantage they never relinquished in cruising to the 18+ championship. The victory erased the bitter taste of losing in last year’s finals and gave the Thunder their first Holiday Classic title. “[It was] very important to get back and win it this time,” said Tampa manager Pier Ballesteros. “We’ve been together a long time and talked about [winning a championship] right after we lost last year.” Vic Pagan finished 2-for-3 with a double, RBI and run scored, while Alex Novell added two hits, an RBI and run scored as Tampa finished with 13 hits. Those hits, plus uncharacteristic Coral Gables’ defensive miscues led to a trio of big innings that proved the difference. After the A’s trimmed a four-run deficit in half, Tampa broke the game open by scoring three runs in the sixth and three more in the seventh. Rodriguez, who pitches for an Independent League team in Puerto Rico, proved he was more than capable of holding the lead. Relying on off-speed pitches, mixed with occasional fastballs, the right hander’s only start of the tournament was a memorable one. He retired the first seven batters he faced, then 10 straight from the fourth through seventh innings. It was during that second juncture when his dominance was most important. After run-scoring doubles from Pagan and Novell helped stake the Thunder to a 4-0 first-inning lead, Coral Gables mounted its only threat of the game. The A’s, who rolled to a 3-0 round robin record by outscoring their opponents 16-3, used a one-out walk and Nick Silva’s booming double to right-center to cut the deficit to 4-1. When Silva scored on an error one out later, the lead was cut in half and Coral Gables appeared to seize the momentum. But when a running miscue ended the threat, the Tampa lead remained and Rodriguez went to work. The right hander didn’t allow another hit until Albert Santiago’s one-out double in the seventh. By then, the advantage had swelled to 10-2 and Tampa was nearly home free. The loss kept Coral Gables from earning a third tournament championship in four years and fifth overall. The A’s captured titles in 2015 and 2016, before missing the playoffs last year. For the Thunder, a week that began with anger, disorder and a whole lot of missing equipment and uniforms, ended in the sun. 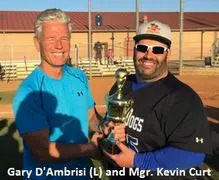 Even if it came following a marathon 10-inning, 9-4 semifinal victory over the same Dade City Brewers which defeated them in last year’s tournament championship game. The extended game pushed the start time for the championship back nearly two hours, but following what had occurred, the delay was negligible. And in the end, they won a Holiday Classic tournament championship as well. WP: Rodriguez. LP: Roque. 2B: Pagan, Novell, Cappuyo, Martin (T). Silva, Santiago (CG). Pitching: Roque, Jordon (7) and Pagan (T). Cappuyo and Mojica (CG). January 15, 2018, Kissimmee, FL – Dave Benedict knew. So too did the Vituro Health Cardinals. In fact, anyone who’s followed the Holiday Classic during the past decade is more than familiar with the script: Give the Boston Wolfpack any advantage and their virtually assured of winning the title. While the right hander went about holding the Cardinals to seven hits and a single fourth-inning run over eight-innings of work, Boston did what it had throughout the tournament. Entering the final, the Wolfpack had outscored five opponents by an incredible 72-5 margin, including dominating playoff victories over the eighth-seeded Clearwater Rays (16-2) and third-seeded Jacksonville Hops (15-0). In the championship game, Boston grabbed an early lead, doubled it in the third, countered the Cardinals’ lone run with another in the fourth and then put the game away in the fifth. Even that outburst was remarkable in its execution. Despite beginning the inning with a pair of outs, the Wolfpack utilized a Sean Miller double and two walks to load the bases. Then, German Rivera drove a ball into the left-centerfield gap to clear the bases and firmly stamp Boston’s claim to yet another title. Except for a quick fourth-inning outburst that plated Vituro Health’s only run, Benedict was nearly flawless. Leading 4-0, the righty allowed Bubba Wagnon’s one-out double to center, Joe Williams’ single to second and Jeff Fortune’s RBI single to left that cut the deficit to 4-1. That’s as close as the Cardinals got. The team tournament MVP got a called third strike for the inning’s second out, before inducing a ground out to third to end the threat. Just as important as limiting the damage in the fourth was Boston’s ability to make the difficult defensive play look routine. The Wolfpack converted three ground ball double plays and made several other outstanding efforts to rob the Cardinals of hits. In the end, it was all just status quo for a team that’s made winning Holiday Classic championships as natural as throwing, hitting and catching. WP: Benedict. LP: McSparen. 2B: Wagnon (VH). Benedict, Smith and Miller (B). 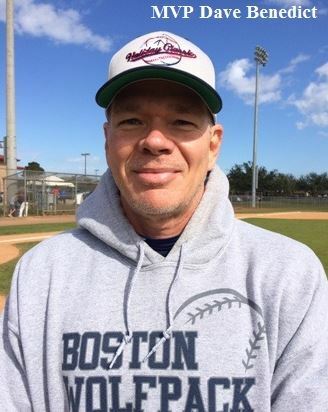 January 16, 2017, Kissimmee, FL – Watching his team score 10 runs while sending 14 batters to the plate in the sixth inning, it would have been understandable if Boston Cardinals manager Rich Slamin relaxed, knowing his teams’ second Holiday Classic championship in three years was all but assured. But not Slamin, not against the East Coast Cardinals, and not when you’re playing for the memory of a loved one. Sure enough, the offensive explosion was matched in the bottom half of the inning when EC scored nine runs of its own. In the end, it was Slamin’s lack of complacency that kept Boston from relaxing and, as a result, helped finally put the game away over the final three innings. When it was finished, Boston had earned an offensive-dominated 20-11 victory over the defending champions that spoke as much about resiliency as it did for love and comradery. In a tribute to Ellis Robles, the mother of a Boston player who died of cancer, and as a signal of the family bond this Cardinals team possessed above all others, each cap was initialed with the letters “ER.” Slamin said it was her memory that helped make this team – and this championship – so special. “Two years ago, we had a great team and won it all, but the chemistry wasn’t good,” the manager said. “Last year, we went with a group of very talented players and couldn’t do anything. This time, we just wanted to come here with guys who respected each other and treated each other like family. It really paid off in the end.” Even if it wasn’t always pretty. With a game time of three hours and 54 minutes, the teams combined for 31 hits, five errors, nine base on balls and six wild pitches. Still, when it was over, Boston players agreed that the championship victory – despite the flawed execution – was even better than the title won just two years ago. “This one is special, because we all did it together,” Slamin said. With Boston leading 2-1 following Luis Valdez’s first-inning RBI single and a third-inning Darwin Hernandez sacrifice fly, the game’s dynamic irrevocably changed in the sixth. An infield error was the prelude to 11 Boston batters reaching base and a close game becoming a rout – even if for only a half inning. Tournament MVP Steven Rodriguez, who finished the week with 18 hits, had a run-scoring double down the left field line for a 3-1 lead, before Hernandez blasted a two-run homer to left to make it 5-1. And Boston was just getting started. While winning pitcher Alexis Fumero went about shutting down East Coast hitters the rest of the way, Boston immediately pushed the lead back to 15-10 in the top of the seventh. It then put the game away with five more in the ninth. Not surprisingly, Steven Rodriguez played a role in both, singling twice and driving in two.